Studying their award-winning game, Infernus: Verse 2, Motalen used eye tracking to add advanced options to their usability testing suite for mobile gaming. With the mobile device testing solutions from Tobii Pro, the development team was able to immediately identify patterns in the players' eye movements that allowed them to improve gameplay. According to a 2015 Nielsen study, the average person spends over 10 hours a month playing games on a mobile device. Apps like Clash of Clans and Candy Crush have proven the mobile gaming industry is here to stay and becoming increasingly competitive. At the same time, the usability failures in this category far exceed that of console and computer-based games. New York-based app developer, Motalen believes that this problem is due to the lack of usability testing during the creation process. To address usability concerns, Motalen began developing a testing suite for the mobile gaming space. This platform included eye tracking in order to provide advanced information on the player's experience. By adding this type of usability testing to the mobile gaming design process, they hoped to evolve mobile gameplay testing from guesswork to more rigorous evaluation procedures. Motalen decided to use this advanced usability testing suite to assess their exciting role-playing game, Infernus: Verse 2. They wanted to find ways to optimize gameplay and user engagement. In our case, eye tracking helped unravel the players’ feelings towards a game as well as how well the menus and inventories were formed for ease of search. This would have been close to impossible to find out without an eye tracking system involved. Motalen asked 30 volunteers, ranging in age from 19 to 29, to participate in user testing for Infernus: Verse 2. The participants were asked to play 30 minutes of the game on an iPad while eye tracking and other biometric data was collected. 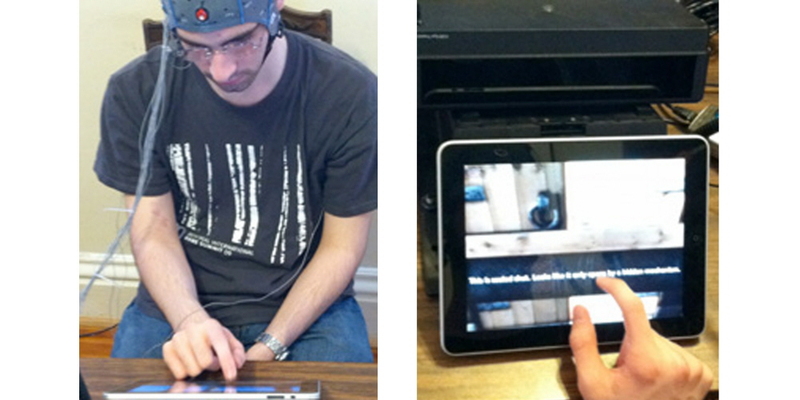 The Motalen team used the Tobii Pro X120 eye tracker mounted on the Mobile Device Stand (see image to the left below) to monitor eye movement, as well as an electrode cap to detect brain signals (EEG- see image to the right below). Combining the data from these two biometric devices provides important information about what the player is experiencing from their point of view. The participants were also asked to wear ear buds to help to keep outside noises to a minimum to ensure they were engaged in the game throughout the testing session. Data from the Pro X120, the electrode cap, and a video camera were synchronized using custom software. This information was then analyzed using proprietary algorithms that produced quantitative metrics describing the state of the player during particular stages of the game. 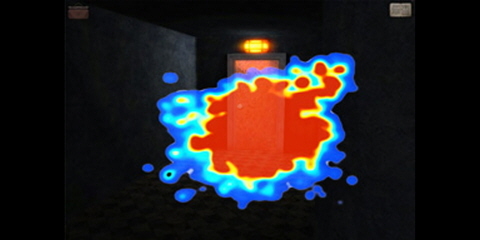 From the eye tracking information, Motalen also produced heat maps that were overlaid on the video (see image below). These quantitative and qualitative results were aggregated for all 30 subjects. After adding the Tobii Pro X120 to their usability suite, Motalen immediately found patterns in the players' eye movements that proved of substantial importance to their testing metrics. The eye tracker allowed them to determine if a player was bored, focused, or even confused while playing the game. For example, if a player was frantically looking around the screen, this indicated hints of stress and fear. On the other hand, there were times when the participant would keep a steady gaze at the center of the screen. This was witnessed when the subject was in an intense part of the game that required high concentration. The Pro X120 ultimately allowed the Motalen development team to improve gameplay in Infernus: Verse 2. They were able to track and retrace where players were looking on the screen when sifting through the inventory or searching for clues. This was important data since the game primarily focused on trying to solve various puzzles to escape. With the eye tracker from Tobii Pro, Motalen found patterns in the way players searched the screen that helped them improve Infernus: Verse 2, as well as future games of a similar nature. Eye tracking is extremely useful in that it can find a player’s motives and make game play much more fluid, creating a better experience altogether.